Trumpf’s recent In-Tech open house was a demonstration of the benefits derived through the use of all its technology together. Accurate punching/laser cutting of blanks featuring self-locking features combined with their subsequent high-accuracy bending and forming on its press-brakes provides perfect fit-up (through locking features) allowing high-speed parent-to-parent metal laser welding to complete the part which then goes on to be laser marked; all on Trumpf technology. 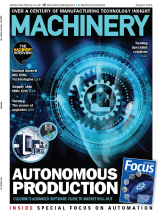 Within the overall theme, individual machine developments highlighted were the TL 2510, a 3,000 by 1,250 mm sheet capacity laser profiling machine featuring simple, low-cost automation where the machine carriage is used to push/pull pallets. The new Trumatic L3040 launched at the recent EMO show features an additional, linear motor-driven axis in x on the carriage providing 300 mm travel which means that faster movement can be achieved as acc/dec of 15 m/sec2 is possible. But individual investments in a company can deliver bottlenecks, Trumpf is encouraging users to look at their process in total.